The designer or process engineer selects the weighting factors by determining each evaluation factor contributes to the final evaluation score. The final evaluation score has relative meaning for different feasible strip layouts producing the same part. Therefore, it can be used to find the best solution for processing the particular part. Let’s turn our attention to the influence of feed height factor, which determines the quality of a strip layout based on the distance the strip must travel upward before feeding forward. The factor ranges from 10 (worst) to 100 (best). Typically, the designer seeks to lift the stock as little as possible: lifting takes time, and as lift height increases so must lift velocity or acceleration. Consequently, feed accuracy can suffer, or the strip can become unstable due to vibration and bounce caused by excessive acceleration. Increased feed rates, die strip vibrations and strip bounce can negatively affect part accuracy, often leading to more complicated die designs. Seldom is the feed height for a progressive-die strip zero. Even if the strip remains completely flat, some lifting is required to break the oil seal created by lubricant trapped between the die surface and the strip. Lifting of the die strip also proves necessary to ensure that the leading edge of the stock does not catch on die openings or mismatches in die surface heights when feeding from station to station. For that reason, a minimum feed height lift typically is specified, and referred to as a safety factor. For our purposes, we’ll establish a safety lift factor of 2 mm. 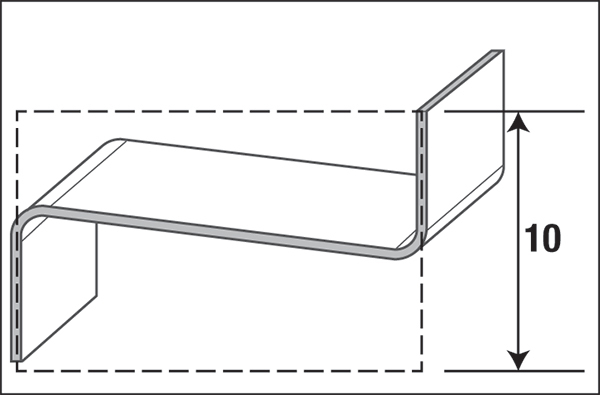 In most progressive dies, bending of the feed stock is required to produce the desired part; oftentimes bending is the dominant forming mode. After the feed stock is bent, it must be lifted above the die surface in order to advance to the next station (Fig. 1). To determine the required feed height for a given strip layout, the designer must evaluate the lift height at each die station. Lift height, H, equals the greatest lift distance at any of the die stations (step 2 in Fig. 1), plus the safety factor. Hmax = the maximum possible lift, equal to the height of an imaginary rectangle that encloses the formed part (Fig. 2) plus the safety factor, S.
To further increase the final evaluation score, the designer pays attention to the primary factors assigned the highest weighting factors (1.0 is highest). The weighting factor prioritizes each primary factor in order of importance when compared to the others. For example, a primary factor assigned a weighting of 0.5 is half as important as one assigned a weighting factor of 1.0.